When your business office or facility in Greater Houston has been damaged or affected by storm damages, trust the local leader in commercial disaster restoration at ServiceMaster Advantage. We offer 24/7 emergency services for storm damage restoration in Houston. 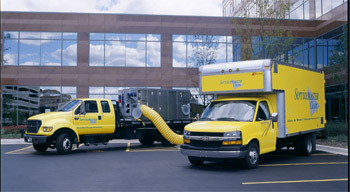 When your office has suffered wind, water, fire, or structural damage, ServiceMaster Advantage can help. We know that storm damages can force a business in Houston to come to a complete halt, but with our expertise in commercial disaster restoration, our team of restoration experts will help alleviate the stress of temporarily closing down. When we service your business facility or office, we’ll work swiftly and efficiently to repair and restore your business back to its rightful state. We want nothing less than to see your business up and running again. Our team of restoration experts is well versed in the effects of wind, water, and fire damages. With our commercial construction services in Houston, we’ll be able to cleanup debris, provide structural repairs, reconstruct sections of your facility, and manage the overall project to ensure high quality results. When your business facility or office has sustained damages due to heavy rainfall, wind damage, or even a hurricane, you can rely on the local leader in Houston storm damage restoration, ServiceMaster Advantage. Our phone lines are open 24/7, 365 days a year. When you call, we’ll dispatch a team of experts to begin the restoration process immediately.